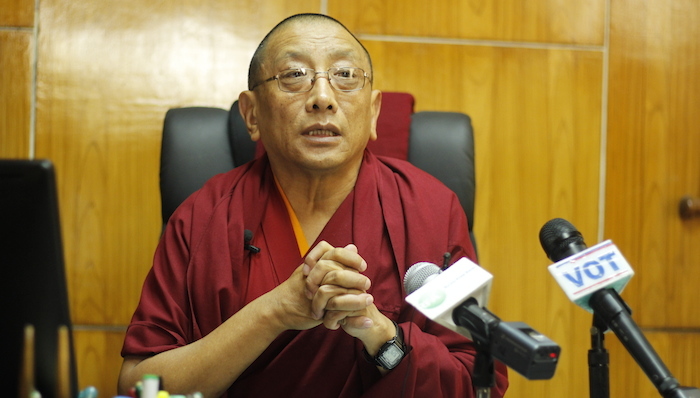 (TibetanReview.net, Dec13, 2017) – The minister for religion and culture of the Central Tibetan Administration at Dharamshala was on Dec 11 elected as one of the vice-presidents of a New Delhi-based international Buddhist group. Kalon Karma Gelek Yuthok was reported to have been elected to the post at the end of the General Assembly Meeting of the International Buddhist Confederation (IBC) held in New Delhi over Dec 10 -11. The chief guest for the inaugural function was Mr Kiren Rijiju, India’s Minister of State for Home Affairs. Others who attended the function were reported to include spiritual heads of the Cambodian and Bangladeshi Buddhists, as well Kyabji Gaden Tri Rinpoche, the head of the Gelug order of Tibetan Buddhism. There was a screening of a video message from His Holiness the Dalai Lama, which was followed by the welcome speech delivered by Professor Samdhong Rinpoche, the presiding president of IBC. The theme of the meeting’s discussion, which took place on the second day, was “Buddhist Heritage, Asokan Legacy and Way Forward for IBC”. Many scholars presented papers on a range of issues. The day also saw a video message from the Gyalwang Karmapa Rinpoche being presented and messages from the Sakya Trizin Ratna Vajra Rinpoche and the Drikung Kyabgon Chetsang Rinpoche being read out. The IBC was established in 2010, following a visit to Sri Lanka by its founder Ven. Lama Lobzang. Some respected Sangha members there suggested to him that India host a major international Buddhist conference. This resulted in the holding of a Global Buddhist Congregation. IBC has been set up to create a role for Buddhism on the global stage so as to “help to preserve our heritage, share our knowledge, and promote our values and to represent a united front for Buddhism to enjoy meaningful participation in the global discourse”.